What’s good for bears is good for wilderness. What if it was possible to protect wild places by protecting a single family of animals? As wilderness ambassadors, bears are a barometer for the health of forests and ecosystems. 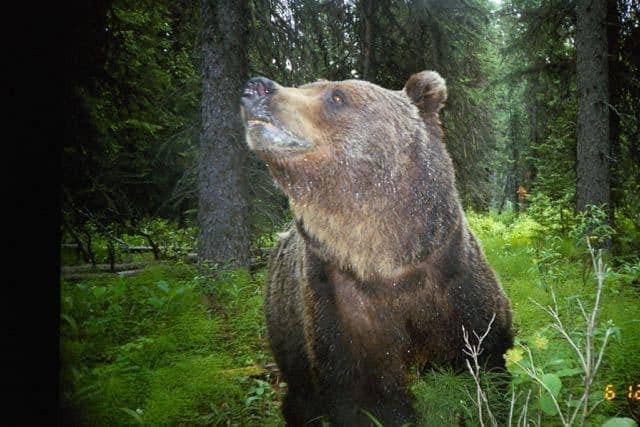 If bear populations are thriving, it’s more than likely their natural surroundings are, too. The Crown is one of only two continuous ecosystems remaining in the lower 48 states where grizzlies, elk, moose, cougar and wolves still thrive. Here, the highest grizzly bear density in the north american interior is thriving. Our European Wilderness Society Team member Gudrun Pflueger was living and working in the Crown on the Canadian side for the Mistakes Institute , gathering wilderness experience second to none. “Living in a little tent for 5 month, hiking hundreds of kilometer and moving 24 remote cameras all around the study area, gives you a pretty good idea about the quality and integrity of this area, but unfortunately also about the immense threats to wildlife, caused by large scale clearcutting, by the huge pressure from ATV use and of cause oil and gas activities. Beside destroying habitat, all those things need roads which open the land to hunting and poaching. A road is the beginning of the end of wilderness”. Wild places aren’t wild without healthy ecosystems. And what bears need, we need. Go outdoors and explore nature. See the connections between all living things. Remember, what’s good for bears is good for people. Learn about a scientist, teacher or organization doing work to protect wild places and the animals that live there. Support that scientist, teacher or organization with either your time or your money, or by promoting their work to others. Find out what’s happening locally in your part of the world, city or neighborhood and get involved.